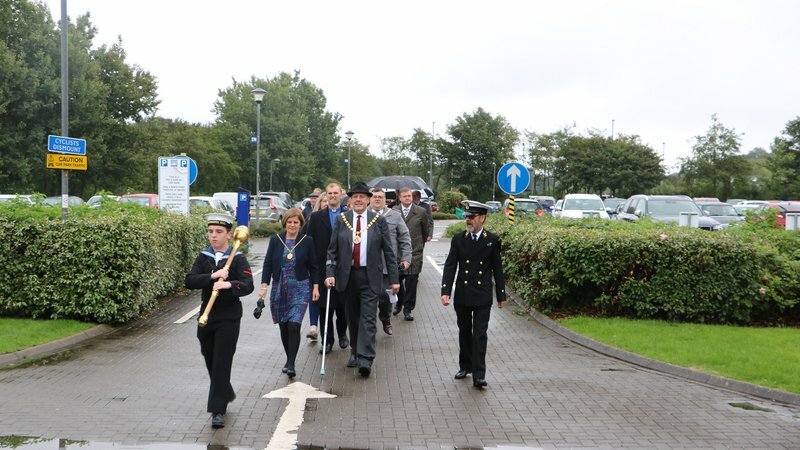 Allerdale Mayor, Councillor John Crouch, led today’s ceremony marking Merchant Navy Day. The flag-raising ceremony took place at Allerdale Borough Council’s offices in Workington. Over 30 people joined Cllr Crouch in marking the work of the British Merchant Navy, including local veterans, councillors, mayors and members of the public. The local Sea Cadets provided the bugle salute and Reverend Philip Jackson led the prayer. Merchant Navy Day takes place nationally on Monday 3 September. Hundreds of places across Britain will take part in the Seafarers UK ‘Fly the Red Ensign’ campaign, to honour those who kept our ‘island nation’ afloat during both World Wars, and celebrate the modern day Merchant Navy seafarers who are responsible for 95% of the UK’s imports, including half the food we eat.